Smart Choices, Strong Voices is peppy and bright, addressing real situations children encounter and ways to address these situations in a positive way. A friendly stranger offers some bottles of water to Ben at the park as he takes a break from the game. His friends race over and remind him of safety rules. 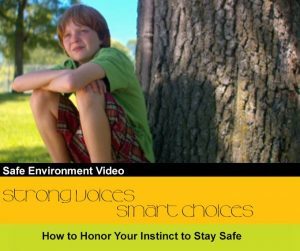 Later at home, Ben’s parents express their concern about his lack of judgment and inform him that his older brother and his friends are turning the situation into a speech class project about personal safety. The teens present an animated lesson that explains the difference between trusting adults and respecting them. They also illustrate how to avoid bad situations, how to respond if something bad happens, and how to get help from someone they trust. This 10-minute video comes with a 10-page study guide that contains background information on the Safe Environment training, information about what the Catholic Church has done to effectively respond to sexual abuse by church personnel, preparation for the teacher, a synopsis and objectives of the video, instructions for how to use these materials, and discussion questions. It is intended to be used in a group setting with a computer and projector. Contact information: Catholic Education Ministries, 320-251-0111 or email . Personal Power is peppy and bright, addressing real situations young people encounter and providing good advice for handling these situations. Zach and his friends are at the high school when they learn that a stranger has approached Zach’s little brother at the park. Their parents recognize that the teens have more credibility with the elementary-school kids, so they ask Zach, Maya and Jade to prepare a presentation about personal safety. The teens explain the difference between trusting adults and respecting them. They also illustrate how to avoid bad situations, how to respond if something bad happens, and how to get help from someone they trust. As Zach, Maya and Jade research and prepare for their presentation, they learn a lot along the way. Personal Power addresses numerous dangers that kids face today, including social media liabilities, texting, portraying themselves as older than they are, and others.